The dinner was part of an occasional series to showcase the stories of those that have reached the top of their field in business. Previous speakers have included Gail Kelly and Chris Cuffe. Peter’s return to Newcastle and to Prosperity was a blast from the past for him, a man who in 1984, at 23 years old started his career in coal in Lake Macquarie with ‘$500 bucks and a ute’, and by 26 had made millions. Fast forward 28 years and today he is the worldwide leader of a billion dollar public company “but still at the beginning of the biggest journey” he says. His is so much more than a local boy made good story. At Prosperity we had the pleasure of working with Peter in Newcastle and then in Linc’s formative years through our Brisbane office. Peter’s lessons are real, raw and honest. He shared with us on the night the seven things that made his journey from small business to global company possible. They are poignant lessons for all those growing a business, particularly those facing tough economic headwinds. So I want to share them with everyone we work closely with so you too can benefit. 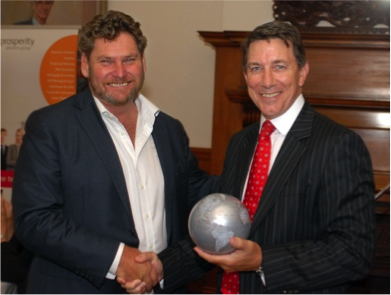 Prosperity CEO, Allan McKeown congratulates Peter Bond (left) on his impressive local to global journey. Peter Bond has one thing that many business owners don’t… an impressive, passionate and unerring vision for the business he wants to create. And he is proud to admit it. And Peter’s passion extends much further than building a successful business. In fact Peter is committed to providing the world with an environmentally friendly or ‘clean’ process for converting coal into oil that will change our capacity to produce energy in many countries throughout the world. “Every country in the world that is long coal and short oil can change it’s energy futures right now,” he said. This is his vision, and given his impressive track record to date, I have no doubt that he can deliver on his promise. As your business grows he was emphatic that you need different people in different roles, roles that suit the business’ growth requirements. “The people who were with you in the first five years are probably not the same people who will be with you in the next five, or the next. You need different skills as your business grows, and fresh people around you to challenge your team and take the business where it needs to go”. “The people who were with you in the first five years are probably not the same people who will be with you in the next five, or the next." As a business owner, you must understand the macro economic trends your business is built on better than anyone else. “You must understand the price points that make your business successful and the trends that underpin your ‘industry’s growth’. I was looking at the oil price back in 2004 when it was just $27 per barrel and with a well researched understanding, it was obvious oil was headed higher, much higher. It is this trend that provides the foundation for Linc. Peter shared at length his insights into the enormous shift of Asian population into the middle class that is changing the way our world uses energy, driving the commodity cycle and supporting oil prices at $100 or more for the longer term. “This trend is not going away,” he said. “And, we know that there are some heavy weights holding the oil price up, chiefly those massive oil producing nations who have low direct oil cost, but high costs of sovereign operations. Whilst their oil production cost can be as low as $10-12 per barrel, their government operations cost a lot more, putting the effective oil price at between $80-$95 a barrel to keep them funded. Whilst you could never prove it, whenever the oil price slips a little, the taps appear to slow down, restricting supply until demand catches up. “It is these very trends that are likely to keep oil above $80/barrel and pushing over $100/barrel for the foreseeable future,” he said. “But, these sort of trends are everywhere, and knowing how your business fits into them is critical to your strategic planning and positioning of your business”. Linc Energy takes their systems and processes very seriously. “In a public company, the systems and procedures that you put in place are the foundation of your growth. At Linc we have been very focused on proving our systems, processes and procedures for creating a clean energy business. It is these robust systems that enable us to grow the way we have and take the company worldwide”, he said. It is also imperative to know how you are going to fund the growth envisaged in your business plan. “I wrote a business plan for Linc when it was worth $1 million that planned for the entry of public funding. It needed it to succeed. We needed to bring in investors to give us the scale to expand worldwide and execute on the opportunities in front of us,” he said. Don’t underestimate the power of good sales and marketing. Peter Bond was adamant that he now does very little that has the potential to achieve less than a 5X return. Whilst to many of us that seems surreal, his explanation was direct and enthusiastic. “At 15 to 20% returns I am not an entrepreneur, I am a business manager, and that’s not what I am,” he said. While this is a very brief overview of Peter’s extensive presentation there are take home messages we can all learn from and apply to our businesses. Whether you run a development company, a mining operation, a manufacturing business or a services firm, you can apply them to your scale of operation and adapt them for success. From ‘500 bucks and a ute’ Peter’s business interests now span 400 global coal, oil and clean energy assets stretching from Uzbekistan, Alaska, across the US and Australia with more to come. His story is a truly inspiring one.